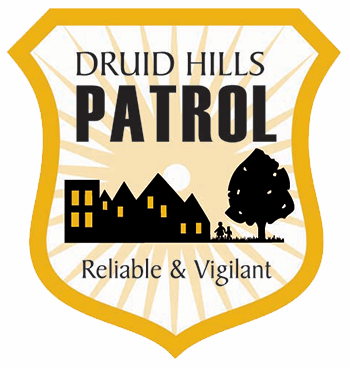 The Druid Hills Patrol is a nonprofit 501(c)(4) organization, managed by community volunteers, whose mission is to make Druid Hills a SAFER community. • All of our officers are off-duty City of Atlanta and DeKalb County Police officers. They patrol our neighborhood wearing full police uniform and carrying all standard equipment, including radios, handcuffs and weapons. • DHP officers maintain direct two-way communication with 911 and monitor police radio for both jurisdictions to listen for criminal activity in Druid Hills. • DHP officers have emergency response capability and full powers to arrest. They are managed by our Officer-in-Charge, Atlanta Police Lt. Tony Singh, and patrol in our clearly marked DHP vehicle, which is equipped with police lights, horn and megaphone. • Unlike police department beat officers, DHP officers do not have to leave our area to respond to calls in other areas. Their ONLY assignment is to deter crime in the DHP coverage area and monitor police radio for emergencies in Druid Hills. When they are on patrol in the neighborhood, they usually respond faster than DKPD or APD officers. • DHP officers provide vacation visits to members' homes and document their visits. If they need to contact the homeowner about circumstances on the property, they have the ability to do so at the time of their visit. • Upon request, they will perform detailed home security assessments for members to highlight security vulnerabilities and recommend corrective action. • If a member suffers a theft or break-in, our officers serve as advocates with the police department to ensure that the member receives the follow-up and attention s/he needs. Atlanta Police Department, Zone 6, Beat 608 and DeKalb Police Department, North Central precinct, Beat 220. View the APD and DKPD beat maps (links below) and consider that for both departments, ONE officer is assigned to patrol the entire beat AND respond to 911 calls such as car accidents, burglaries, robberies, assaults, domestic violence, etc. Memberships renew on January 1, and dues are billed in November for the following year. New memberships initiated later in the year are prorated for the current year. Biannual payments are due December 31 and June 30. NOTE: The Druid Hills Patrol is funded almost entirely by member dues. We also accept donations and welcome sponsorships. Please visit the Donate or Sponsor page to learn more.